The Mohawk Valley has played an integral historical role in human settlement, migration, and transportation of New York State, mainly due to its beneficial transportation route, the Mohawk River. The Mohawk River connected the Atlantic Ocean with the interior of the North American continent and catered to the needs of westward bound settlers. This strategic location attracted farmers in the 1700s and provided a transportation route and a number of jobs for the Germans, Dutch, Highland Scots, and the Iroquois Confederacy. In the 18th century, the Mohawk Valley was a frontier for political, military and economic growth. European settlement and trade with the Iroquois set the stage for commercial and military competition between European nations. This competition led to the French and Indian Wars, and eventually the American Revolution. Almost one hundred battles were fought in New York State during the American Revolution. 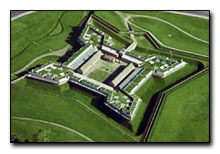 British forces were defeated at Fort Stanwix and the American patriots triumphed over Burgoyne at Saratoga. The Oneidas were the first Indian nation allied with the Americans and played a vital role in the Battle of Oriskany and the defense of Fort Stanwix (now a reconstructed historic site located in downtown Rome). The 1789 Treaty of Fort Stanwix with the Indian nations made the patriots the beneficiaries of extensive land redistribution. Immigrants arrived in the region from Ireland, Italy, and Poland in the late1800s and early 1900s. They worked in mills and manufacturing facilities, bringing their own unique blend of cultures to the Mohawk Valley. The Erie Canal, completed in 1825, and paralleling the Mohawk River, was the first major commercially successful connection between the East and West. The region experienced a significant simulation in industrial development and was exploited by thousands of immigrants. Construction began on July 4th, 1817 in Rome, New York and was the first 15 mile section to be completed. The canal made boom towns of many central cities in the Mohawk Valley and provided an immense contribution to the wealth and importance of those areas. New transportation systems led to the destruction of the Erie Canal along with the New York State Barge Canal taking over in 1918. 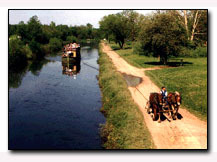 Portions of the canal can still be visited today.